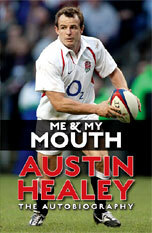 AUSTIN HEALEY is one of English rugby’s best-known characters. His extraordinary career has seen him win 50 England caps, star on two British Lions tours and play a leading role in England’s most successful club ever – Leicester Tigers – where he won four Premiership titles and two European Championships. He’s rightly regarded as perhaps the most versatile and skilful English player ever and has won fans the world over. But his outspoken nature means he’s courted controversy along the way. In Me And My Mouth, he lays bare the backstage wrangling that bedevilled England’s World Cup winners and wrecked those Lions tours – and lifts the lid on the hilarious behind-the-scenes escapades fans rarely get to hear about. Now with a new career as a BBC TV presenter ahead of him, Austin’s sure to stay in the public eye…and this book will ensure he keeps on ruffling feathers.